A pistol (also called an automatic or auto) is a handgun but is not the same as a revolver. The cartridges are in a magazine, which is a metal or plastic box. The magazine is usually inside the handle of the pistol. When the pistol is fired, the empty cartridge pops out, and the next one comes up into position. The magazine is spring-loaded so it pushes the next bullet into place as the empty cartridge is ejected. For that reason pistols are sometimes called "semi-automatic". When the magazine runs out of cartridges, it can be reloaded by inserting more cartridges. There is a degree of confusion between pistols and revolvers. For example, in the American Old West revolvers were used but were then (and even today by some) called pistols. One of the most important rules of gun safety is to keep guns out of the hands of children. Guns should be locked up and kept away from children and others who do not appreciate how deadly they are. Pistols like all guns should always be handled carefully. Always keep the gun pointed in a safe direction. A shooter should keep their fingers away from the trigger until the moment they intend to shoot. Always respect guns as a tool that can cause harm if used incorrectly. Always assume a gun is loaded until you are certain it is not. A bullet is not the only part of a gun that can cause injury. Hearing protection will protect the eardrums of the shooter and those nearby. These can be inexpensive foam earplugs or more costly hearing protectors that have a Noise Reduction Rating or NRR. The higher the NRR number the better. Eye protection should be worn at all times while shooting or observing other shooters. Their impact-resistant lenses protect against bullet fragments, stray bits of gunpowder, and other debris. The advantage of pistols over revolvers lies in the somewhat faster reloading of magazines that carry more bullets that a revolver's five or six rounds. This is why most police and military organizations use pistols. Also, pistols are often thinner and can be worn concealed better than revolvers. Pistols are generally regarded as being safer than revolvers. A revolver can fire accidentally if dropped. A pistol rarely fires if dropped. A common feature of pistols is a lever called a safety. The safety prevents the pistol from firing even if the trigger is pulled. To fire a pistol, first remove (turn to the off position) the safety. Pistols have a few disadvantages when compared to revolvers. They are more complicated and have more moving parts. A pistol may use heavier springs that younger and elderly shooters may find difficult to use. Modern pistols usually only fire one shot every time you pull the trigger. Some special pistols, called machine pistols, can fire more than one shot at a time. Some famous pistols are the Colt M1911 and the Beretta 92. Pistols were not often used in the western United States during the 1800s. They used revolvers. 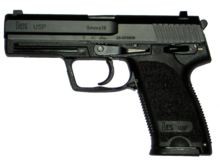 The first successful pistol being used then was the Borchardt C-93. It was designed in 1893, and became available in 1894. ↑ Kyle Wintersteen (22 July 2014). "9 Most Misused Gun Terms". Guns&Ammo/Outdoor Sportsman Group. Retrieved 29 December 2015. ↑ 2.0 2.1 Editorial Board (19 October 2015). "Keeping guns out of children's hands". The Washington Post. Retrieved 29 December 2015. ↑ Grant Cunningham, Gun Digest (18 September 2013). "5 Advantages of the Revolver". The Daily Caller. Retrieved 29 December 2015. ↑ "Revolver vs. Auto". Personal Defense World/Harris Publications, Inc. Retrieved 29 December 2015. This page was last changed on 24 April 2018, at 01:43.